When off-duty police officer Wayne Churchouse locked eyes with the petrified child in the water he knew instantly something terrible was happening. He was paddle-boarding near Rotorua on Sunday when he chanced upon three little girls he initially thought were playing. "As I came up the oldest one looked me straight in the eye with absolute fear in her eyes, then she screamed out 'help'," he said. 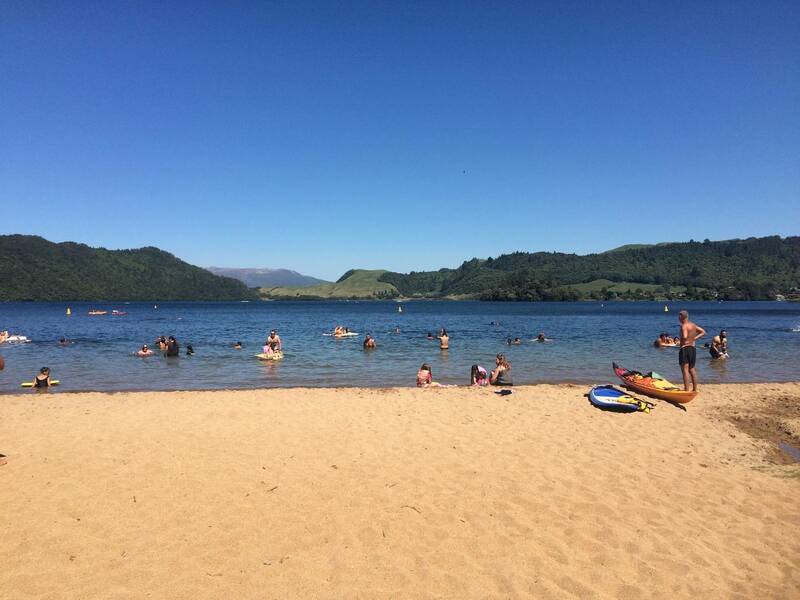 The Senior Constable and youth aid officer from Dannevirke was off Boyes Beach on the shore of Lake Okareka. He noticed the girls as he returned from deep water to the edge of the area where people were swimming. "The youngest was about 7 and the oldest about 9. "I thought they were just playing, they were bobbing up and down and the youngest was climbing onto the oldest." Churchouse didn't hesitate - he dived off his board and plucked the little girls from the water. All three had gone under by the time he got to them. "I had to reach down under the water and bring them back up," he explained. Churchouse helped the trio to shore and made sure they were okay. "They were coughing and spluttering but they were talking, they were all good," he said. Once they had caught their breath the girls ran off into the crowd on the beach - assuredly to find their family. Churchouse said the beach was packed and he did not see who the girls were with. He said the water immediately off the beach was shallow, but the lakebed dropped quickly at a certain point. He found the girls just past it. "There were people all around them, the closest was about 5m away but no one else noticed," he said. "They were very lucky." Churchouse shunned talk of bravery or heroics. "I'm not that much of a hero - it wasn't that much of a drama," he said. "I'm just a good Samaritan, it's just what you do - you get in there, humans need to help each other out." Over the years he has rescued "quite a few" people from the water - including his own son. The pair were swimming near Maketu a few years back when trouble stuck. "My son was about 10 at the time. There was a quite a big lady being supported in the water by her partner, they floated down and then she got swept away from him. "She was trying to grab anything she could find - and she found my son. She was panicking, she tried to climb on top of him." Churchouse swam out to help and faced a dilemma - who to save? "I was thinking, do I save my son or help her?" he recalled. "My son could swim so I made sure he was on his way back safely and then I took her in." Churchouse said he would always go straight in to help someone in trouble in the water. "It's not scary, I'm very confident in the water and I guess I'm a bit of an adrenalin junkie." The policeman also made headlines in 2014 when he rescued a teenage boy from a cave. He was leading a camp of at-risk teens when one fell down a bank. Churchouse had to scramble down and navigate a 4-metre drop to reach the injured child. He urged anyone near the water this summer to be vigilant and keep an eye on fellow beachgoers. "I'm a police officer so it's my profession to be vigilant and observant," he said. "There were hundreds of people on that beach and not one of them noticed the girls - they had no idea what was going on. "There were lots of kids out there screaming and playing - they could have been just another kid, but they weren't. "My message is for everyone to be extra-vigilant, keep an eye on each other, especially young children, even if they can swim, because it's the people who can't who try and climb onto them." 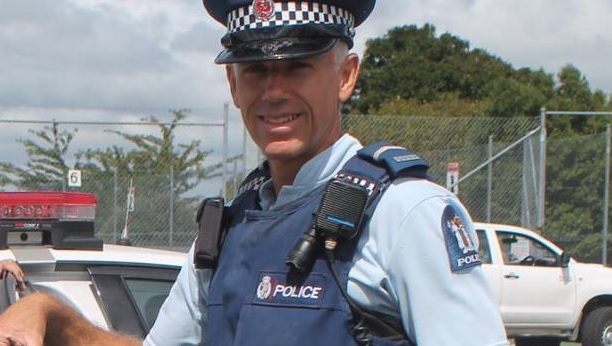 Water Safety New Zealand chief executive Jonty Mills said drowning remained the number one cause of recreational death and the number three cause of accidental death in New Zealand, with 92 preventable fatalities in 2017. "It's our hope every family makes water safety a priority this summer," Mills said. "If you're going on holiday with small children check properties for water hazards and make sure pool gates and latches are in good working order. "However, the only foolproof solution is constant active adult supervision and keeping toddlers at arm's length at all times around water."